I got into the recruiting business about five years ago when I founded Bright.com. We were obsessed with using data to connect prospects and employers, and we constantly fantasized about what we could do if we had access to all of LinkedIn’s professional data. Then, as luck would have it, we were acquired by LinkedIn in February of 2014. So what have we been up to since then? Everyone on the Talent Solutions team has been heads down re-imagining recruiting on LinkedIn. We asked ourselves two simple questions: How can we empower almost anyone who recruits to be a data-driven recruiter by making our products more intuitive? And how can we we tap into our more than 380 million members’ relationships to help everyone who recruits identify and hire the right talent faster? Today at Talent Connect Anaheim I shared the results of our re-imagining: The next generation of LinkedIn Recruiter, and LinkedIn Referrals. That causes recruiters to spend less time recruiting and more time conducting research to write search strings. And numerous other recruiters told us they aren’t domain or Boolean experts, so they don’t know which terms to include in their search strings. That’s why the next generation of LinkedIn Recruiter unlocks the full potential of LinkedIn to empower almost anyone who recruits to be a data-driven recruiter and identify and hire the right talent faster. It all starts with a much simpler, faster, and more intuitive search experience. All you need to do is enter your employee’s name into the search field, and select their profile. LinkedIn Recruiter will automatically build your search string using the job title, skills, company, and industry, listed on the employee’s profile. It will show you the terms it used to build the search string, let you add or remove terms, and instantly update the list of members who meet your search criteria – helping you quickly identify the members who are a match for your open job. But what if you don’t have an employee in mind? All you need to do is provide a term or two and LinkedIn Recruiter will help you write your search string using all the data on LinkedIn (aka the Economic Graph). Let’s say you enter “product manager” into the Job Titles search field. LinkedIn Recruiter will automatically provide you with a list of product managers’ top skills, companies with the most product managers, and the top schools product managers graduated from. The list of members who are a match automatically updates in real time as you accept the terms LinkedIn Recruiter recommends. Advanced recruiters can continue to use their own Boolean search strings. Once you hit “search,” a new feature called Spotlights will show you the members in your talent pool that are your co-workers’ first-degree connections and could become referrals (more on that in three sentences); have engaged with your talent brand (for example, followed your Company Page or liked, commented on, or shared one of your Company Page Updates); and have previously applied for your jobs. These subsets help you gauge whether or not members are interested in your company, and then prioritize who to contact and how to contact them. The next generation of LinkedIn Recruiter will be available in Q1 2016, and is a free upgrade for LinkedIn Recruiter users. Please contact your sales representative for more information. About 80% of recruiters say the best channel to recruit quality candidates is employee referrals. They usually take less time to hire, are a better cultural fit, are higher performers, and stay longer. Yet most companies struggle to get employees to make more referrals. That’s because referral programs rely on employees – who aren’t recruiters, and have day jobs – to keep track of their company’s open jobs, mine their networks for qualified referrals, and then decipher their company’s cumbersome referral software. And if they complete that process, they rarely receive updates on their referral’s status. It’s no wonder only 18% of recruiters are satisfied with the level of employee engagement their referral program receives. 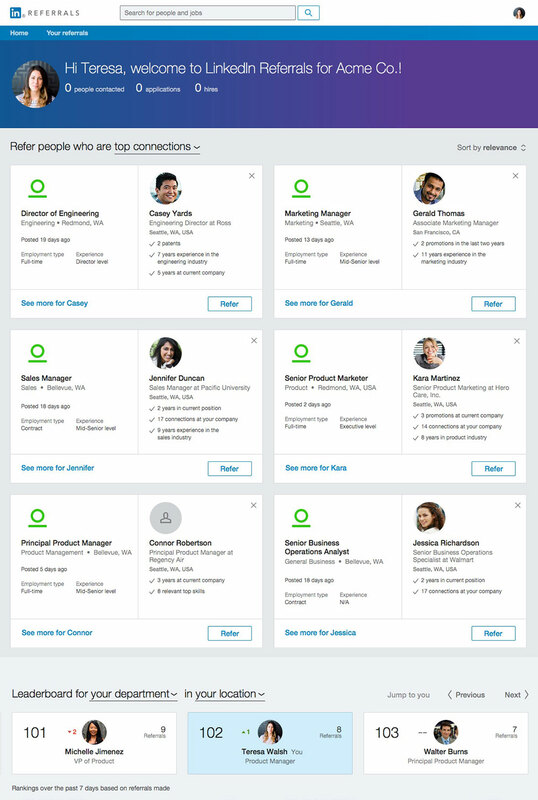 LinkedIn Referrals automatically identifies your employees’ first-degree connections who are a match for your open jobs on LinkedIn. 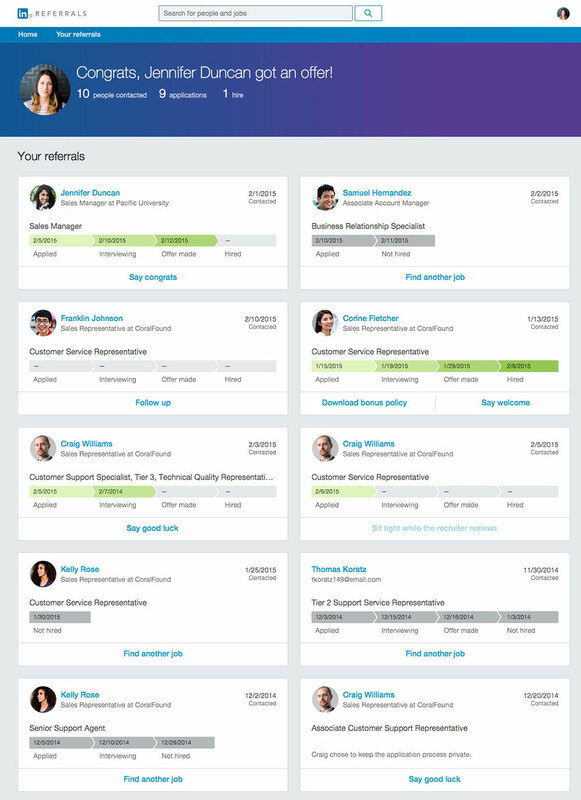 Employees can see their connections who are matches on your company’s dedicated LinkedIn Referrals website. It will also send a summary of their matches to their work email address every two weeks to help spur engagement. 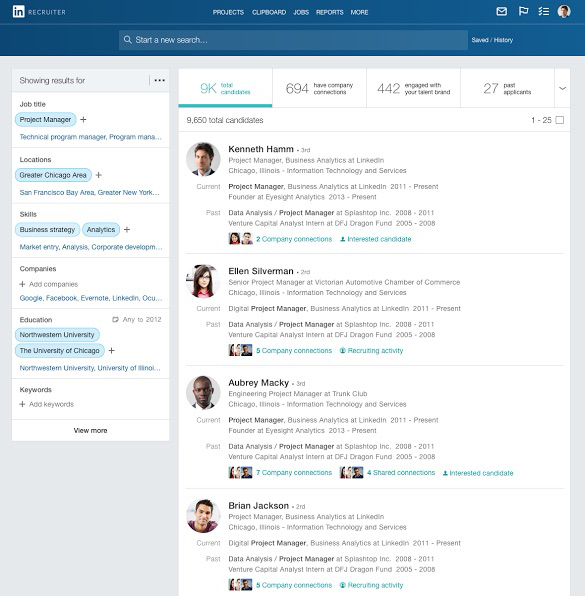 Employees can then send connections open jobs they’re a match for via InMail or email, and share jobs via status updates with all their connections on LinkedIn, Twitter, Facebook, and, Google+. You’ll only receive the referral if the member applies for your open job, which ensures you only receive referrals who are interested in your open jobs. LinkedIn Referrals provides powerful insights that help you take charge of your referrals program because it integrates with leading applicant tracking systems. You can track referrals, measure employee engagement and ROI, and send customized message to employees thanking them for their referral or encouraging them to make more referrals. And you’ll be able to see from within your applicant tracking system which candidates are referrals and which employees referred them. 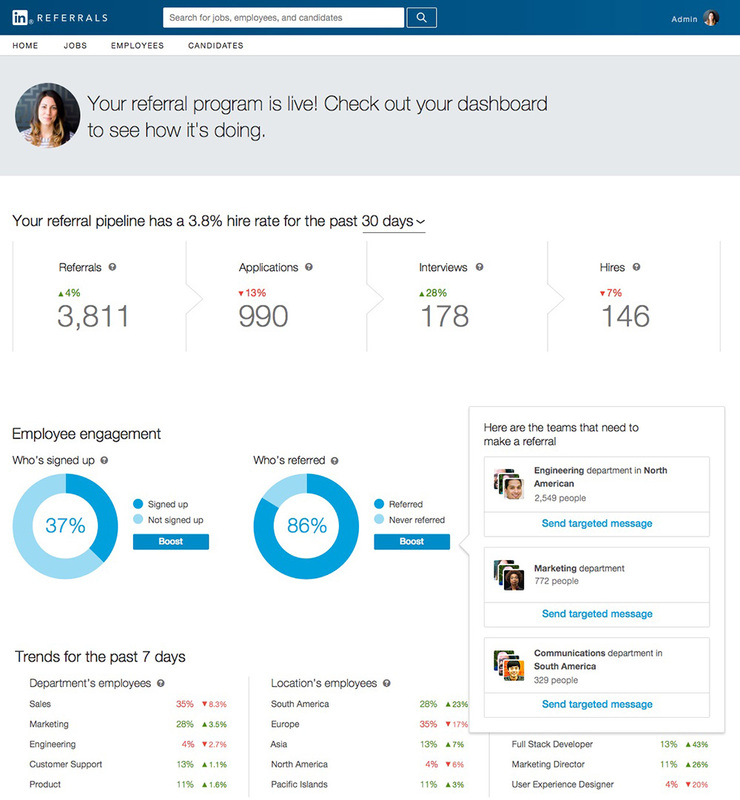 Plus, LinkedIn Referrals automatically keeps employees updated on where their referral is in the hiring process, and even prompts them to congratulate their referral when they receive an offer. As you can see, LinkedIn Referrals takes the work out of referrals for you and your employees. It will be available on Nov. 1. Please contact your sales representative or click here for more information. On behalf of the entire Talent Solutions team, I’d like to thank you. The next generation of LinkedIn Recruiter and LinkedIn Referrals resulted from the invaluable feedback, requests, and wishlists you and the rest of our customers gave us over the last 20 months. We can’t thank you enough, and can’t wait to see how both products help you hire the right talent faster, freeing up time you can use to be a more strategic advisor to your company.